Lenore, the first ever millennial secret bot agent is missing. Last scene location: Denver, Co. Lenore was working on exposing secrets of well-known L&D and game/gamification leaders when reportedly went lost. Check out the people of interest here. James Bound is assigned to the case. Bound is bound to Denver to locate Lenore but he needs help. 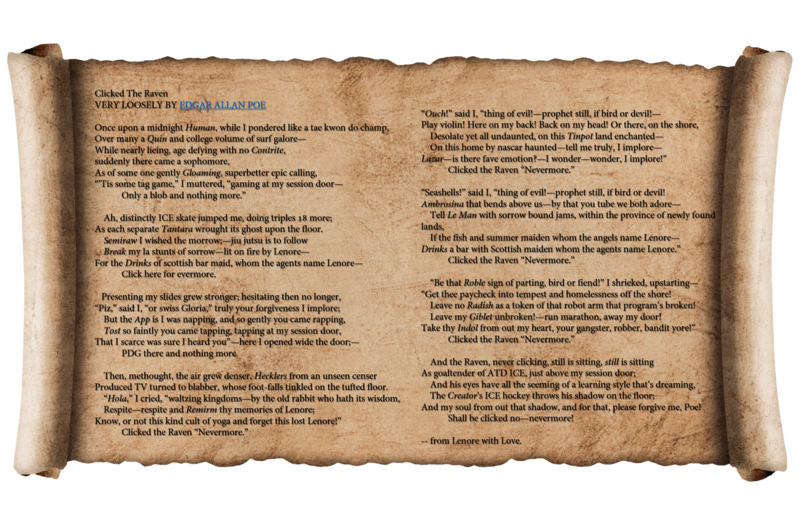 The only clue (exhibit #1) so far is an ancient scroll with Lenore’s last encrypted message about the Raven. Not sure what the significance the Raven plays yet (prophet, bird or devil?) but the epic call is out there for allies. James Bound needs your help! As each separate Tantara wrought its ghost upon the floor. PDG there and nothing more. Produced TV turned to blabber, whose foot-falls tinkled on the tufted floor. “Seashells!” said I, “thing of evil!—prophet still, if bird or devil! “Get thee paycheck into tempest and homelessness off the shore! Leave no Radish as a token of that robot arm that program’s broken! Leave my Giblet unbroken!—run marathon, away my door! And my soul from out that shadow, and for that, please forgive me, Poe! — from Lenore with Love.